The highlighted elements are the nonmetal elements. 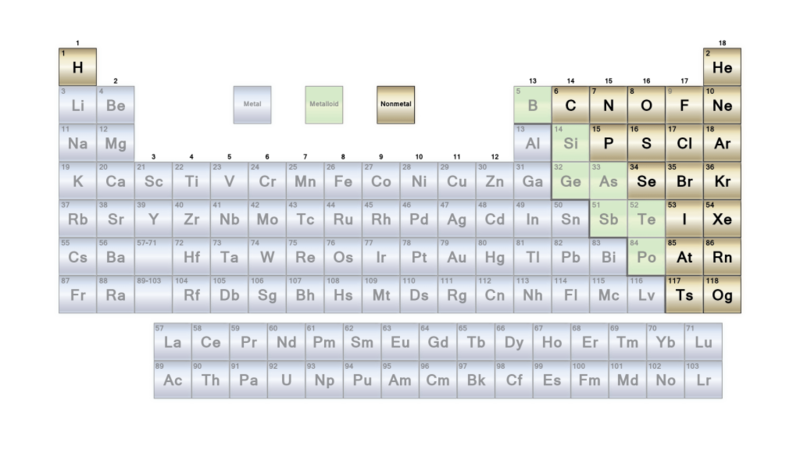 The nonmetal elements occupy the upper right-hand corner of the periodic table. These elements have similar chemical properties that differ from the elements considered metals. The nonmetal element group is a subset of these elements. The nonmetal element group consists of hydrogen, carbon, nitrogen, oxygen, phosphorus, sulfur and selenium. Hydrogen acts as a nonmetal at normal temperatures and pressure and is generally accepted to be part of the nonmetal group. This is a list of the nonmetal elements in order of increasing atomic number. slightly as temperature increases and decreases if it is lowered. Some metals–e.g.